Saffron and cardamom, and even chilies and chai…in chocolates! 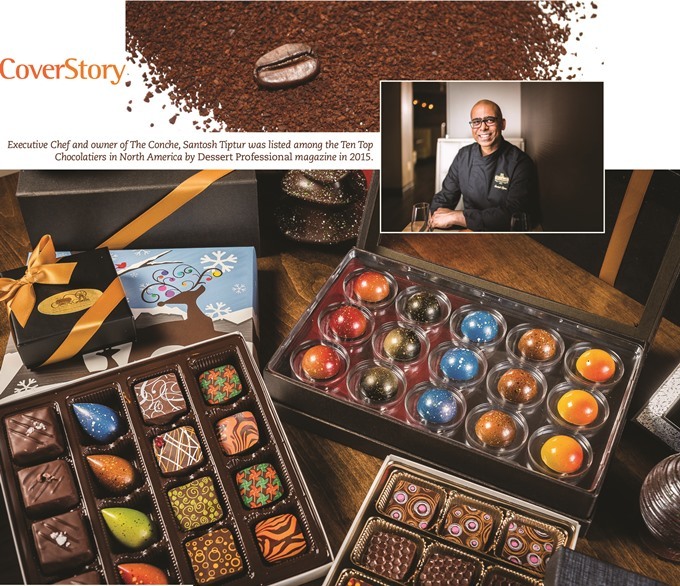 From Michelin-starred chefs to path-breaking entrepreneurs, Indian-Americans are making an impact in the world of gourmet, artisan chocolates. Remember that? 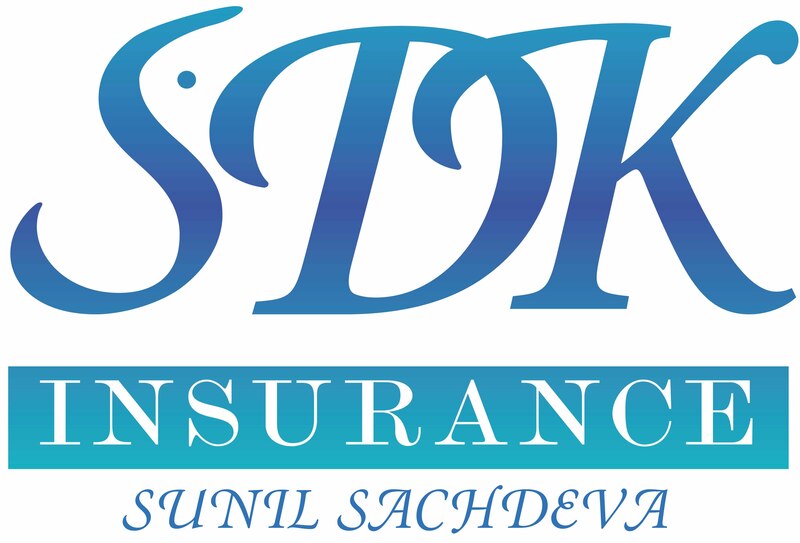 It translates to “Real Taste of Life,” and was a successful ad campaign of yesteryears by Cadbury Dairy Milk (chocolate) in India. Indeed, in a landscape dominated by mithai, the traditional Indian sweets, where chocolate was an exotic outsider, Cadbury had managed to pierce that barrier of otherness to make itself a household name. The flip side of Cadbury’s success was that when it came to chocolates, the world of Indians began and ended with this iconic brand. Chocolate itself was a rare treat. Indians living abroad visiting India would always be asked to bring back just about any kind of ‘foreign’ chocolate and as much as could fit into a suitcase. Now, of course, the chocolate landscape in India has changed and every kind of gourmet chocolate is available in this huge, burgeoning, consumer society. Knowing the backstory of immigrant lives, it’s no surprise that Indian-Americans still have that insatiable chocolate hunger. 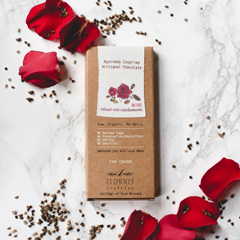 Having made a mark in every business in the U.S., it’s sweet to know that they are also getting involved in the business of gourmet, artisan chocolates. At the recent Big Chocolate Show in New York, the Indian hand was visible—and sometimes invisible—in the international world of trendy chocolates. (Left) Surbhi Sahni, a Michelin-starred chef, and (above) some of her chocolate creations. Her truffle named “Excite” lists ingredients that truly bring home the fusion: Pistachio Crunch Halwa, almonds, lentils, Valhrona dark chocolate, and fennel. 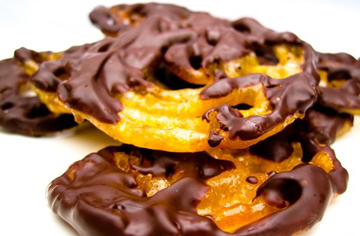 Michelin-starred chef Surbhi Sahni is a noted chocolatier and pastry chef who runs BittersweetNYC, which ships India-inspired confections all over the USA. She also sells her cutting-edge creations in numerous gourmet food markets and street fairs like Little Italy’s San Gennaro Festival. 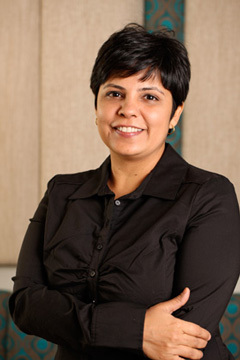 Sahni, who completed her Bachelor’s Degree in Hotel Management from the School of Hotel Administration in India and her masters in Food Studies and Food Management from New York University, has worked in high-end restaurants like David Burke and Donatella. Married to celebrity chef Hemant Mathur, Sahni has over the years created the desserts in restaurants like Tamarind, Amma, Devi, and Tulsi. Her truffles with an Indian flavor have crossed over to the mainstream. Some of the flavors include Ginger (candied ginger, ginger ganache, Callebaut dark chocolate); Coconut (coconut, reduced milk, green cardamom); and Chili Chocolate (Indian red chilies, reduced milk, dark chocolate, Valrhona cocoa powder.). A truffle named “Excite” lists ingredients that truly bring home the fusion: Pistachio Crunch Halwa, almonds, lentils, Valhrona dark chocolate, and fennel. Can chocolate get any more Indian than that? At the Big Chocolate Show, Sahni had a constant stream of mainstream consumers trying out her India inspired confections. “I think the country has evolved. We are all looking not only for new products but new concepts. The mainstream is also truly global and wants to know what the next big thing is. I feel Indian products are going to be placed in better and better markets. The younger generation of the South Asian community is also adventurous for new flavors,” said Sahni. Even non-Indian chocolatiers are experimenting with Indian flavors. At the show I met a Lithuanian chocolatier who was well-versed with Indian spices, and she uses turmeric and ginger in her chocolates. (Left) Alak Vasa quit a high-powered job on Wall Street to start Element Truffles, a maker of Ayurvedic chocolates. I also met Alak Vasa, a young Indian chocolatier who had forsaken a high-powered job on Wall Street to start her company, Element Truffles. 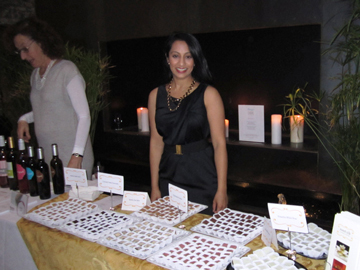 A former trader with Goldman Sachs, she was at the Chocolate Show with her Ayurvedic chocolates. Talking about the dramatic switch from trader to artisan chocolatier, she says, “Wall Street was stressful; you were always on your feet. It was intense! Then, I was introduced to the world of spirituality.” Vasa, who grew up in Ahmedabad, Gujarat, always had a sweet tooth and is a big believer in Ayurveda, meditation, and the natural lifestyle. This prompted a thought, “How wonderful it would be if I could blend these two dimensions of inner and outer comfort!” Ayurvedic chocolates was her answer. She explored sweeteners, essential oils, and other ingredients to find the right nutritional ones to come up with chocolates that truly answered to the call of modern sensibilities of increasingly exotic tastes that don’t come at the cost of health. Vasa is one of the many who are transforming chocolate from a unhealthy indulgence to a healthy one, using ingredients like dark chocolate, honey, sea salt, and spices like turmeric which are all considered to be good for the body. Organic Raw Cacao Powder forms the basis of her chocolates. Additionally, her chocolates are vegan, making them the perfect choice for the increasing number of those who are either allergic to dairy or simply averse to it for health considerations. In contrast, commercial chocolate bars are loaded with ingredients that are increasingly scoffed at by the contemporary medical establishment—processed sugar, table salt, and preservatives, to name just three of them. “The beauty of Ayurveda is that you do not have to sacrifice decadence in order to experience that state of harmony,” reads a line from her blog. Vasa’s creative foray into the world of chocolate has certainly been more than harmonious—her Dark Chocolate Vegan Ice Cream with Turmeric (pictured left) was selected as the June 2017 recipe of the month by Chocolate Connoisseur, the industry’s leading magazine. She sells her chocolates online and in a few dozen retail outlets in the U.S., such as yoga centers, natural food stores, and farmer’s markets. Mr. and Mrs. Balu started out selling grinders for idli-dosa batter. 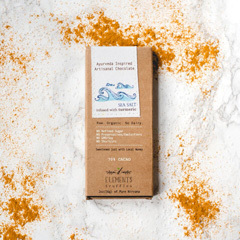 Improvising from there, and finding a market niche, they launched CocoaTown, which is now a recognized catalyst for the “bean-to-bar” industry amongst small scale chocolate makers. While the inspiration of India is visible in the use of Indian spices like turmeric, cardamom, and saffron, and even chilies and chai in chocolates, it was at the show that I first got to learn about the invisible hand of an Indian-American couple in providing the machinery for making artisan chocolates. This delicious bit of information was provided to me by Robert Bowden, a New Jersey chocolatier who put me in touch with Dr. M. Balu and his wife Andal Balu of Atlanta who, he informed me, were providing equipment to several chocolatiers in the U.S. and abroad for the last 15 years. Their chocolate-making machine first started out—believe it or not—as a grinder for making idli batter! I connected with the Balus and learned some intriguing facts about the innovation and can-do attitude of Indian-American entrepreneurs. 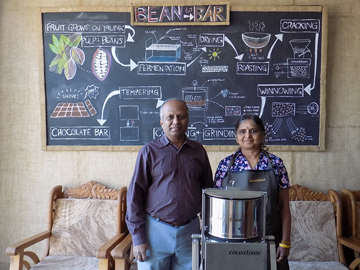 It is hard to believe that this couple that is originally from Tamil Nadu is such a big resource for hundreds of small scale chocolatiers across the world. Andal Balu did her Masters in Coimbatore before working as an Agricultural Research Scientist. She came to the U.S. after marrying Dr. Balu M. Balasubramanian, a chemist. 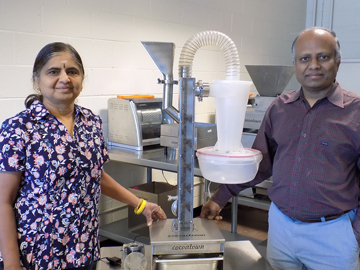 They formed Inno Concepts Inc., and started out by getting a dealership for grinders from India for grinding idli and dosa batter. It was this ingenuity and level of engagement that helped the Balus make a transition from suppliers of grinders for South Asian households to becoming a supplier of chocolate-making machines for many earnest chocolatiers around the world. In 2007, when the economy plummeted, the Balus wanted to diversify. That’s when chocolate came into their lives. They found out that an increasing number of people interested in chocolate-making had the know-how to make it, but faced a big barrier in terms of the equipment. They had to import vintage machines from Europe and refurbish them. Small scale chocolate-makers were often held back mainly due to the scarcity of equipment for their needs. Seeing an opportunity in this gap, the Balus started making machines to make about 10 to 12 lbs of chocolate liquor per batch (compared to industrial equipment which makes one ton or more of chocolate liquor in a batch). Then they came up with bigger machines to make 100 lbs of chocolate per batch, so the customers could scale up. They started with modifying existing idli-dosa grinders for the chocolate industry. The idli-dosa grinders or wet grinders run for 20 to 30 minute batches, but the cocoa nibs have to be ground for 2 to 3 days. So they modified the machine to suit the chocolate industry. 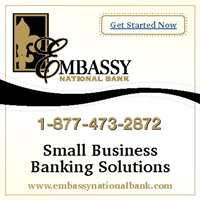 Andal says, “Our customers loved our equipment and we were catalysts for the growth of the ‘bean to bar’ industry. Over the years, they started making other machines specifically needed for the small batch chocolate industry. They already have one patent and are working on a couple more. According to Andal, their company CocoaTown is the only company that makes a series of machines for the bean-to-bar industry for three different levels—laboratory scale for entering or exploring the bean-to-bar business, professional scale to exhibit and showcase the chocolate making process, and commercial scale to expand the business. These grinders sold by CocoaTown have been a savior for artisan chocolate makers, letting them do something which would have been impossible without these machines. The Balus travel to chocolate shows globally and are surprised to find their machines being used in many countries. Not surprisingly, in 2013, the Balus were awarded for “Innovation in Fine Chocolate Production Category” by the Fine Chocolate Industry Association. (Left) Co-owners Bharet Malhotra and Nisha Sidhu of Co Co. Sala, an exciting destination for chocoholics in the Washington, D.C. area. 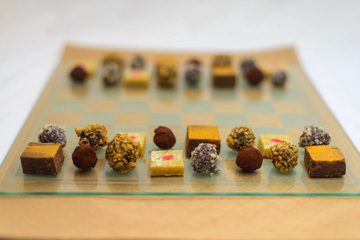 At the retail end of things—in restaurants and lounges—many second generation Indian-Americans are pursuing their passion for chocolates, often with an Indian twist. Co Co. Sala is a hot and happening chocolate lounge, bar, restaurant, pastry shop, and boutique in Washington, D.C., co-owned by two Indian-American entrepreneurs Bharet Malhotra and Nisha Sidhu. 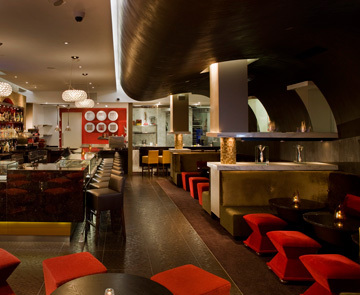 Co Co. Sala, which opened in 2008, has received critical acclaim including ‘hottest bar scene of the year’ by the Restaurant Association of Metropolitan Washington, and reviews from The Washington Post and Washingtonian magazine. Chocoholics can stop by at the 200-square-foot boutique to try artisanal chocolates including the famous chocolate-enrobed bacon, cognac truffles, and hot Coco Pops. The chocolate flavors include Banana Ginger and Mango Lassi. 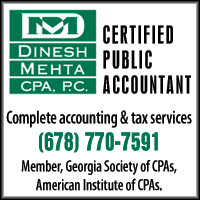 Bharet Malhotra, who had a Bachelor of Science in Biomedical/Electrical Engineering and Economics from Duke University, was an investment banker with Salomon Smith Barney and later worked in mergers and acquisitions with WorldCom, which is now MCI. He is currently in the software industry but at heart, he’s always been a diehard foodie, having eaten his way through 70 countries. 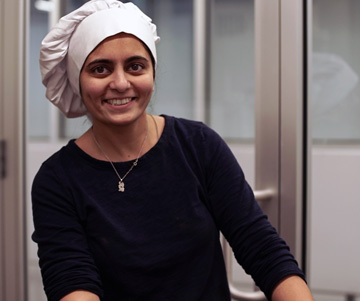 After marriage and motherhood, Sidhu enrolled in the professional Pastry Arts Program at L’Academie de Cuisine. Graduating at the top of her class, she worked in 2941 Restaurant in Virginia as the chocolatier, creating elaborate pastry buffets, wedding cakes, and sculptures. She then started her own company The Sugar Gallery by Nisha before collaborating with Bharet on Co Co. Sala. The very first chocolate he ever ate was a Cadbury’s Chocolate Éclair. He recalls: “I always wondered how this was made, and there was no Google to find out.” That started his love affair with chocolate. After earning a degree in Bakery and Confectionery Technology from the University of Agriculture Sciences in Bangalore, he came to the Culinary Institute of America in New York. Over the years Tiptur worked as the executive pastry chef at the Ritz Carlton in Puerto Rico. 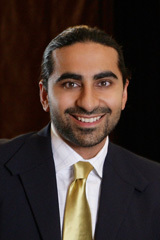 Frequently consulted for other Ritz Carlton locations, Tiptur was on the Pastry Advisory Board, and has appeared on the Food Network. “I like to incorporate chocolate with most of the dishes—that’s a monumental challenge but one I love taking on,” he says. The philosophy behind The Conche is to let guests experience all aspects of chocolate, be it in cocktails, hot chocolates, artisan chocolates and confections, desserts, and even in savory cuisine. (Right) Santosh Tiptur of The Conche, training the next generation of chocolatiers. On Saturdays Tiptur conducts chocolate tastings and chocolate making classes. 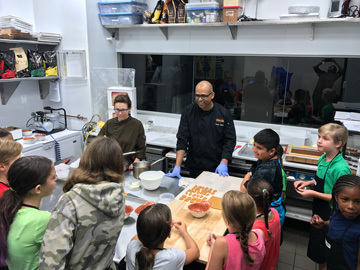 During summer break he also offers three-day summer camps for kids and adults, where they participate in chocolate-tasting-and-making class, restaurant style desserts, plating, and the making of chocolate sculptures. (Left) Shefalee Patel of Sweet Silk, a boutique chocolate maker, speaks of chocolates with the same regard that a sommelier has for wine—as when she tells why they use Guittard and Valrhona chocolate for their confections: for their quality and nuances in their varietals, to match her other fusion ingredients. In New Jersey, Shefalee Patel is the chocolatier behind a thriving chocolate business which is inspired by Indian mithai or burfi. Sweet Silk originated back in 2009 with the concept of highlighting the luxurious ingredients utilized in Indian sweets—with low sugar content and no preservatives. As Americans acquire a more global palate and health and wellness become more important, these Indian-inspired sweets are finding a larger customer base. “We began to receive growing interest from a broader audience due to our gluten free and vegan options,” says Patel. 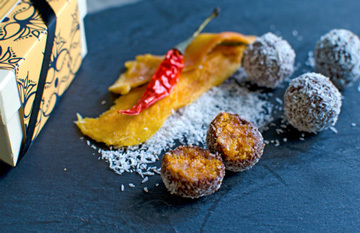 (Right) The mango chili coconut truffle from Shefalee Patel’s Sweet Silk. 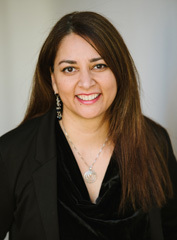 Lavina Melwani is a writer for several international publications. She blogs at www.lassiwithlavina.com. Chocolate covered JALEBIES and chocolate PAANS! Second-generation Indian-Americans are into all the current food trends, and dark chocolate features prominently among their likes. Increasingly, chocolate is playing a more visible role at Indian celebrations. Jharna Jaisinghani of Artistic Affairs, a popular events and wedding planning company in New York, uses chocolates as the modern sweet symbol for weddings. In India, mithai is often sent out as a good ‘shagun’ (good omen) with cards. Jaisinghani offers customized invitation cards accompanied by chocolates. 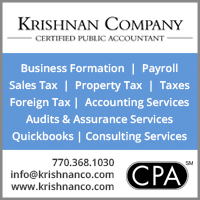 She imports specialty chocolates from India which are custom wrapped in the couple’s personalized choice and given out as wedding favors as well as built into custom hampers for gifts for various celebrations. Even the paanwalla has got into the act! Ankit Narula of Long Island, N.Y., is the paanwalla in demand at celebrations across the U.S. and often flies out to destination weddings with his many flavored paans. He has the ultimate treat for guests—chocolate paans! Narula also creates paan truffles and Choc ‘O’Latte Paans which infuse coffee and chocolate inside a paan. These intoxicating chocolate flavored paans and paan-flavored truffles are so delicious that I challenge you to stop after eating just one! Wait till mainstream Americans discover them!